(2 1/4" x 1 3/16") The most elaborate murrini to date involving hundreds of component parts, fully shaded detail throughout. Loren signature is in the Madonna's brooch. (Size Varies) Component parts, mainly faces included in the Madonna murrini. Full shaded portrait murrini sliced, eased edges, polished and drilled to accept a bail. Early shaded portrait murrini by Loren. 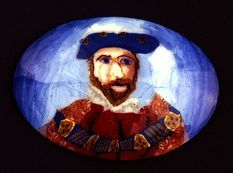 Transparent jewels in tudor hat and across the shoulder pattern. Individual portraits of James Joyce and Walt Whitman. 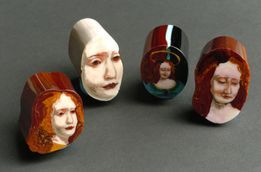 These two portraits were commissioned by Paul Stankard for inclusion in his beautiful spheres.